City Auction Group has reported growing use of its buyer app as trade buyers increasingly use their smartphones to carry out business operations. Launched four years ago, the app now accounts for 22% of all bids – up from 20% a year ago – and was used to purchase 4,000 units over the last 12 months, with an estimated value of over £40m. The figures come just weeks after Aston Barclay reported that its buyer app is seeing fast-growing take-up as used car buyers increasingly rely on their smartphones to run their businesses. Commenting on the City Auction Group app, MD Michael Tomalin said: “We now live in a digital world that is moving to a one-click model, with the likes of Amazon offering a fast and convenient purchasing at the touch of a button. 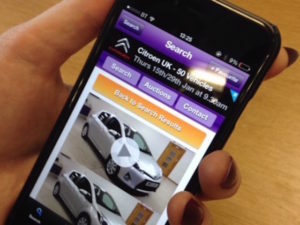 More and more customers expect to be able to use an app to review vehicles, make a bid and purchase at auctions.